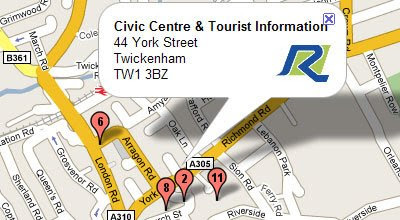 Richmond Council in London have released a number of Google Maps that are designed to help local residents find local government offices and services. They have also created several different 'green' maps to show the locations of eco-homes, schools with solar panels, green businesses, fair-trade shops and farmers markets. The council have created a number of Google Maps showing not just the location of local government offices but the locations of local schools, libraries, polling stations, cemeteries, sport and fitness centres, car parks, halls for hire and allotments. Richmond Council have also produced a number of Google Maps designed to help local residents be more environmental friendly. Under the banner of 'Go Green Richmond' the council have created maps for local green businesses, renewables, eco-homes, fairtrade and organic shops, farmers markets, charity and re-use shops and car club organisations. There is also a Google Map showing all the recycling locations in the area. Ed Parsons (Geospatial Technologist of Google) likes it too.